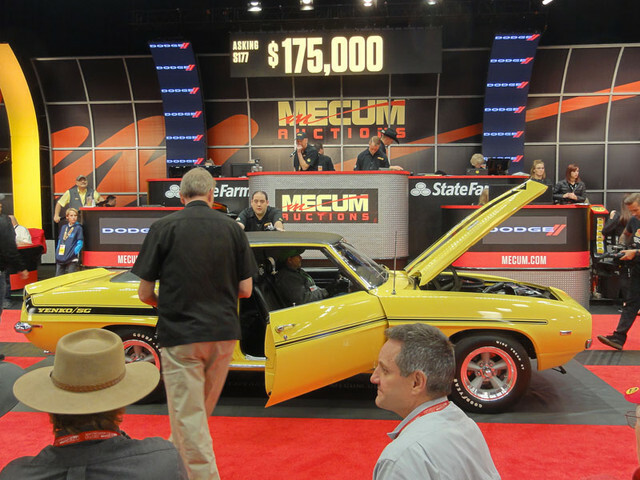 Here is a shot of the Mecum auction. Got to see myself on TV a bit! Some friends were watching it live on TV. They were telling me about the prices. I guess it is back to 1/24th scale for me if I want a classic car. Then again, at $90 a pop for the good ones, I may have to be pretty selective there too! I was the guy in the third row with the Isle of Man TT jacket! The prices actually seemed down on the average for the "blue chip" cars. Still way more money than I can afford, but if I had paid more than half a million for a Hemi a few years ago, I might be a little miffed. I took a risk and registered on the Mecum site to get the prices. So far no spam... Fascinating looking at the prices. I once sold off a business and closed out inventory with an auction. My bad luck to have 2 other auctions being held at the same time nearby. I got slammed on the prices for the good stuff, and sold off a bunch of junk for more than it was worth. Just the vague whims of who shows up. Some of those Mecum prices must have been bidding wars, and other cars like 10 year old Porsches went for under $10K. Antiques went for real low prices. I may have to build a bigger garage like you, Smilo! 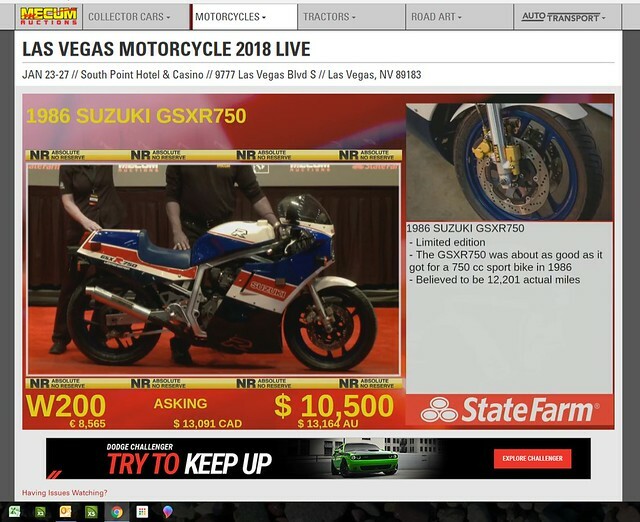 They have a big bike auction coming up this weekend. Too soon for me, but the do have two a year (one in June). I may go to that one. My "gold" membership gets me into their auctions free for a year and it is an opportunity to scope things out for a future southwest bike tour. There will be things at that one that I can theoretically afford to buy, so watch out! Wonder how much the new owner would pay for my stock exhaust?